High tech luxury and futuristic glamour! Sign me up! Ohh wow ! I didn't know about this one yet but it sounds sooo awesome !! 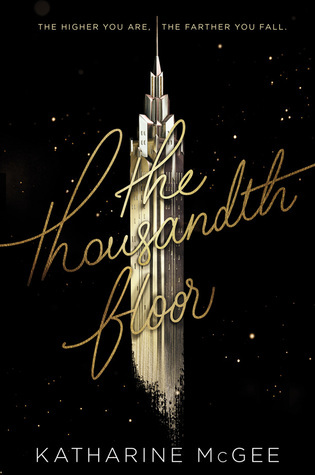 Thanks for sharing The Thousandth Floor!! I've been hearing about this one. It does sound like an enjoyable read. Here's my WoW if you'd like to stop by my blog. The cover originally gave me a 1920's vibe but I like that the story is futuristic. Here's my Here's my WoW @ LazyBookLovers! This one sounds so good! And I love that cover! Great pick! Oh cool! Curious about this one! So weird that the cover was changed so quickly after a reveal. Can't decide which one I liked more! Guess it will have to be the final! LOL! I just heard about this one recently and it sounds so good! Can't wait to read it! Wow! This cover looks awesome! Here’s my WoW and check out this Recommend This! Wednesday to join in! I am seeing this book around a lot! Nice pick! If you would like stop by my WoW too.